The marvellous giants of the deep make their presence known from May through to September every year as the Humpback whales make their great migration. If you are lucky enough, you may see them swimming along what they call The Humpback Highway. If you are fascinated by whales, you will find that Cabarita Beach is superb for land based whale watching. Just head over to the beach and see the whales from afar. Take a stroll on the beach or a lovely walk up to the lookout at Norries Headland. You will be treated to a fantastic view of the whales as well as the stunning coastline up to Kingscliff in the north and down to Hastings Point to the south. Be part of their journey as the females travel past to reach the warmer waters of The Great Barrier Reef to give birth. They will then travel back down the coast stopping to rest the calves at Hervey Bay, before again passing Cabarita on their journey home to Antarctica between August and September. There are many whale watching tour operators that can help you make the most of your whale watching experience. Coolangatt Whale Watch is a popular tour operator. 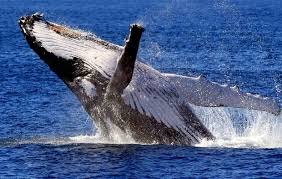 Experience the thrill of whale watching and get up close the majestic Humpback whales. The tour begins with a meet-up at their private wharf to board the vessel, then take a short 15 minute boat ride until you reach the open ocean and start looking for whales. Being located so close to the whale highway, you can normally find whales within the first 30 minutes of the trip. Enjoy unrivalled views of the whales and amazing coastline. The friendly crew will make you feel right at home. Learn all about these superb animals through the informative and entertaining commentary provided by the staff. You’ll be so close to the whales it will take your breath away. Enjoy a memorable holiday and experience an encounter with whales. Boarding the vessel takes place at the Coolangatta & Tweed Heads Golf Club Private Jetty (Alf Rush Memorial Drive, Tweed Heads South). The cruise takes three hours. Only 46 passengers are allowed to board at any given time to prevent crowding. Complimentary morning tea will be provided. Cruises depart at 8.45am daily. 100% guaranteed whale sighting on every cruise, or receive another ticket for another day! Free transfers from Coolangatta, with Southern Gold Coast transfers available upon request. Book your stay at our Cabarita Beach Resort and enjoy an unforgettable whale watching trip. Our resort offers a choice of two bedroom, three bedroom, and four bedroom apartments. Perfect for families, friends, couples and corporate travellers, our resort has apartments to suit your needs.